Recently, I was out riding with a lady whose horse had its head in the air and was looking off in the distance most of the time. The problem with a horse like that is they don’t see the ground that is right in front of them and they tend to stumble when the ground in front of them drops or they trip over logs, sticks and things like that. This horse made me think about people and where their attention is. I’m the kind of person that likes to live in the moment and that has advantages and disadvantages. I don’t mind if my days are spontaneous and fun but sometimes the future sneaks up on me when I should see it coming. There are other people that live so far in the future that they don’t see what might be going on right in front of them just like that horse. 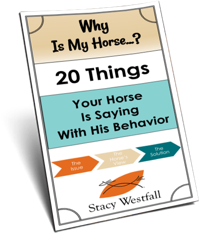 ← Newt conquers standing on the box…but what motivates my horse? I need to follow your advice and focus on now and the future and learn from my past! Always love to hear what you have to say, Jesse. yes! So… what happened to the high-headed horse? I am dealing with a horse who often looks far away at the scenery (particularly cars/boats/trains in the far distance), searching for ghosts as it turns out, something to jump at. Alternatively, he is looking for ghosts in the bushes just in front of him (those scarrrry dirt piles! ), which is not dramatically better. He was super spooky when I got him (having not been used much on the trail), got past it (a year or so of mannnny riding miles and some ground work), and turned spooky again at the start of this winter. We ride alone or with friends, and that doesn’t seem to matter. He is on 24/7 turn out with two other solid horses, same feed as always (grass), no excuse! So … we have been refocusing on me (the rider) with all of the bend/move/flex/back/step over bushes/etc. exercises I can come up with (actually quite easy, he doesn’t fight me, doesn’t seem to be ‘misbehaving’ as much as genuinely ‘scared’.) We also investigate/encounter all of the nearby scary things to see they are not actually, well, scary (which as soon as he gets his nose on it acts like ho hum no big deal). Trouble is? At the barn/at home, I can’t find ANYTHING that scares him to work on. He doesn’t fret about tarps, bags, helium balloons, bikes, motorcycles, tractor, cars (moving or still), other horses, flapping coats and clothes, dogs, geese and birds, deer, skiers, etc, etc etc etc. … anything i can come up with, he handles calmly. Have to be out, and mostly in one particular (semi-urban) area. I’ve also been doing a lot of relaxing in that area, riding, and stopping to graze, which he has to really work at … a horse that will not graze is fretted, indeed! The grazing seems to be helping the most, as it truly reduces his anxiety level very clearly. (and yes, his eyes appear to be fine.) I’d love any additional suggestions or thoughts …. Thank you. I jokingly refer to my mare as a bulldozer. You point her head in a direction and she goes, she puts her foot out and hopes for the best, she deals with what comes when it comes. It’s great because she will go through anything I ask, but I have to stay alert to what she’s going through because she will bulldoze through it and sometimes she shouldn’t. It can be quite dangerous,but she is a pleasure to ride. Very well said. Thank you. Sometimes we all need a little reminding. My horse, Boo, is usually on the hunt for horse eaters. He’s constantly looking for something to scare himself with. When he finds something, usually a trash can, mailbox, donkey, cow, pedestrian, etc., all hell breaks loose. I’ve tried redirecting him, keeping him busy, I’ve even gone so far as to scare him before something scary pops up. Some days are nice and calm, others are like walking through a haunted house. God forbid he trip over his own feet during his booger search. That’s a whole new adventure on its own. Have you thought about having a chiropractor check him out? My mare acted like that, when the chiropractor looked at her he determined she was so far out in her poll she was seeing double (I don’t know, maybe he was feeding me a line). But after working on her a couple of sessions everything improved and that horse eating monster hiding behind the next bush (trash can, mailbox, guardrail, etc.) disappeared! Made a believer out of me! Brilliant advice Jesse. Well said! I think we get more out of life if we live in the present and not too much in the past or the future. 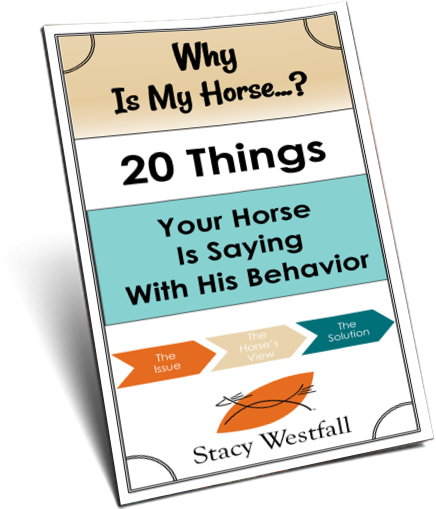 This is one of the biggest lessons I learned by working with horses. and one of the reasons I feel so relaxed after spending time with my horse. 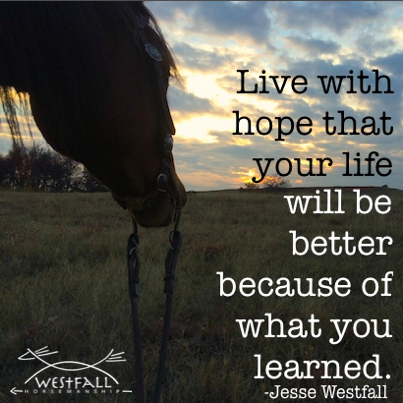 Great post with good advice, Jesse!